Today, in a society flooded with information, where a sharply rising number of Americans are forgoing religion entirely, Spiritualism survives. There are four Spiritualist churches currently operating in Chicago, according to the National Spiritualist Association of Churches. Chicagoans attend services to receive readings, connect with lost loved ones, and become Mediums themselves (“We believe anyone and everyone is Mediumistic,” says Cher Dyle, 64, assistant pastor at Church of the Spirit.) In Chicago and elsewhere, prominent Mediums give workshops on how to become more sensitive to the spirit world. These workshops encourage people to reflect and look inward for answers – a feat that was surely easier in the 1800s when there wasn’t a barrage of multi-screen media competing for their attention. For the people who faithfully attend these churches and events, the disruption of modern technology only proves how vital the practice is. But it’s unclear whether that faith will be enough to sustain the religion through its third century. The Church of the Spirit occupies a modest brick building no bigger than the houses on either side of it in Logan Square. A passerby could mistake it for a house itself were it not for a tall stained glass window and a sign planted in the front yard. The window depicts Jesus Christ holding a lamb, a holdover from the building’s past life as an Evangelical church. 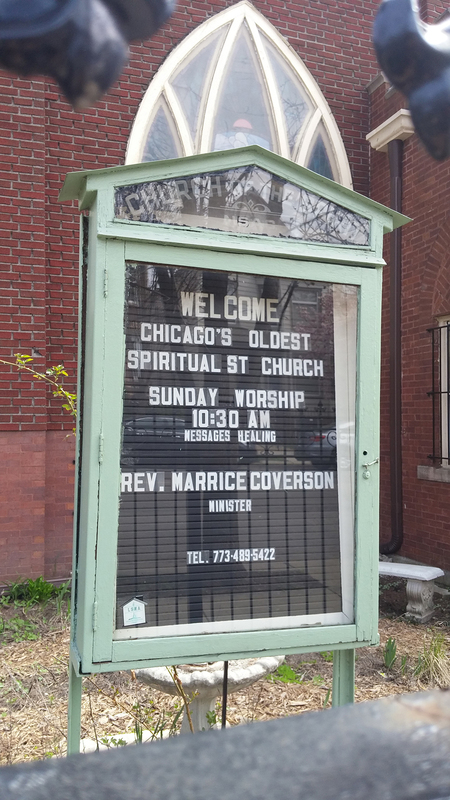 But the sign spells out what it is today: “Chicago’s Oldest Spiritualist Church.” Established in 1897, the church has been in the Logan Square building since 1915. Spiritualism is its own religion, but a look inside the chapel at Church of the Spirit reveals strong ties to Christianity. The pews are equipped with hymnals containing Christmas classics like “Oh Holy Night” and congregants recite the Lord’s Prayer during services. Even Jesus is not entirely out of place on the stained glass window, as some believe he was a Spiritualist Medium. “For us, Jesus is an example. We call him our brother,” says Dyle, who like many of today’s Spiritualists was raised Christian. Twenty-two years ago Dyle was diagnosed with non-Hodgkins Lymphoma and faced surgery. On a friend’s recommendation she went to Church of the Spirit for a reading, which she said gave her confidence to go into the surgery unafraid. She became a member, took “unfoldment classes” to develop her mediumistic abilities and six years ago began teaching them herself. Outside of Spiritualist churches, well-regarded Mediums give unfoldment classes like entrepreneurs give motivational talks. The Rev. B. Anne Gehman is a Medium and clairvoyant known for applying her skills to secular pursuits like helping police solve crimes and locate missing children. She is the subject of a book The Priest and the Medium, by Suzanne Geisemann, which begins with an anecdote in which a young Gehman predicts the JFK assassination while working as a dental assistant. On the weekend of April 18 Gehman, now a youthful 79, led a workshop, Developing your Spiritual Potential, at the Unity Church on the North Shore in Evanston. About 100 people attended the event, some clutching worn copies of the Priest and the Medium in hopes of an autograph. Gehman is poised and petite, with coiffed grey curls and tomato red nail polish. She spent the first hour of the event fielding an astounding scope of questions, most of which she answered as quickly and confidently as if she were being asked her home address. Will we be reunited with our loved ones after we die? In fact, for 18 years Gehman had a pet poodle that she dyed pink by rinsing its coat with beet juice. One day after the pet passed on, Gehman was lying in bed when she noticed little paw prints on the covers approaching her, and felt a sudden warmth at her side. In training the non-Beethovens of Spiritualism, Gehman turns to psychometry – the practice of reading objects. In Gehman’s workshop, participants were divided into pairs and asked to exchange personal items. They traded rings, watches, glasses, and spent a few minutes in silence concentrating on what they felt while holding them. At the end of the exercise, a few eagerly raised their hands and described how the vision of a landscape materialized before them, or how a profound sadness washed over them as they handled their partner’s trinket. Others sheepishly confessed that they had seen nothing, felt nothing. As a teacher Gehman was good-natured but firm, cautioning her pupils to use their newfound talents wisely. “You wouldn’t go looking in someone’s pocketbook. Don’t read their aura without asking,” she said. Whenever someone ventured to describe an intuition as “weird” she cautioned against the word. “It’s not weird. It’s wonderful.” Some who attended the event seemed genuinely intent on developing their spiritual potential, taking diligent notes and asking about the logistics of giving readings. But others likely paid the $60 cost of admission just to see Gehman at work. This was evident in the way the crowd livened up when the time came for her to demonstrate her own skills. Gehman delivered readings from a podium, calling on individuals from the crowd and describing the figures she claimed to see around them. These figures were typically family members or distant ancestors (Gehman described one woman in Victorian garb, another in traditional American Indian dress), but always with some emotional link to the receiver. Love, she explained, was like a gravitational force connecting the spirit world to ours. Concern over retaining the interest of the next generation is nothing new. In his book Spiritualism Today (published in 1969) Spiritualist author Maurice Barbanell writes, “Modern scientific discoveries have made religious orthodoxy more and more unacceptable. Youth is no longer satisfied with what was good enough for their fathers.” His concern is echoed by Chris Bott, 34, Director of Music at Unity Church on the North Shore who coordinated Gehman’s workshop. “People’s minds are not conducive any more to being able to just reflect internally and let there be a stillness,” he says. James worries that in the information age people get wrapped up in the illusion of certainty and dismiss anything that can’t be proven. “We live in an era where absence of evidence is interpreted as evidence of absence,” he says. And while all religions require faith in the unexplainable, Spiritualism is not anchored by thousands of years of history. It has no text, no commandments, no saints or even high-profile celebrity devotees. What it has is what James calls “one of the most diverse communities I’ve ever experienced in a church setting. A really unique group of people.” It falls on those people to keep the tradition alive in an increasingly secular and cacophonous modern world. A framed drawing of the Fox Sisters’ home hangs in the chapel at Church of the Spirit. But these women are not credited with founding Mediumship, only the religion based around it. “It’s like gravity,” Dyle says. “Did Newton invent gravity? No. It was always there but there was an awareness and then a connection was made.” It is this connection – either to departed spirits in another world or kindred spirits in this one – that keeps the members of Church of the Spirit coming back every week.